Connie, this is so precious. I LOVE that beautiful ribbon you used - great choice! Very cute image and love your sponging on here too. So lovely. What a darling image- and you are so right- perfect for the Mom with all boys! Love your rainbow colors! I have lots of catching up to do- you get so many cards made!!! Gorgeous image and beautiful design Connie, I too have sons and this would be lovely. 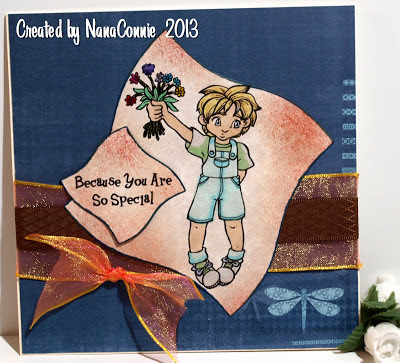 Connie this is such a cute card...love it... thanks for joining us at TTCRD this week. Oh NC, I just love this design and that image is perfect. Simply a remarkable card. What a cute card to link up with us this week over at MSC. Great colouring in and love the image. This is a really pretty card. Love the ribbon you have added. Great coloring. Great card and love the ribbon, thanks for joining CLP's sketch challenge this month! Adorable card! Thanks for sharing with us at My Sheri Crafts! He is adorable! Thanks for playing along with us at Hiding in My Craft Room! How cute... the stippled background is very effective. Thanks for playing along with us at Our Creative Corner.